In order to create the best custom designed hot and cold wound springs on the market, we take quality standards to a whole new level. At RMW Industries, we only hire the best highly skilled and experienced spring designers and manufacturers in the industry, and all of our springs are created using our state of the art and time tested manufacturing process. All of our hot and cold wound springs are created using the highest quality materials available, and are rigorously tested with multiple capabilities in order to meet the standards of our quality control program. At RMW Industries, we can custom build springs to meet your design parameters. All you have to do is send us your drawings and we will custom manufacture your coil springs to the exact specifications you require. 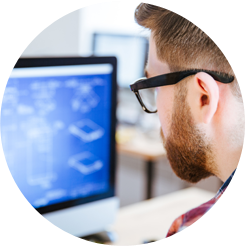 If you don’t have a drawing or design in mind, our team has the expertise and experience to take your spring project from the concept stage through the design and prototype stage, all the way to completion. At RMW Industries, we only stock the highest quality wire for our hot and cold wound springs, and we always make sure to have enough material on hand to meet any production needs. Our team always goes the extra mile when it comes to ensuring that our springs can stand up to even the toughest jobs. All of our coil springs are put through a stringent controlled manufacturing process to ensure that they live up to our extremely high standards. Once our springs are built to our satisfaction, they are load tested using state-of-the-art capabilities to ensure that each spring conforms to the proper required load and rate specifications. All of our springs can also be set removed, if necessary, to guarantee that they won't sag over time. There is nothing more important to us than being able to provide our customers with exactly what they are looking for in a spring product. A big part of that is being able to custom powder coat springs to the exact colour of your choice. At RMW Industries, we understand how important it is for your springs to perfectly match your equipment or company colours. That is why we have our own modern in-house powder coating facility. One of the issues for powder coated springs is that the powder is brittle due to under baking. Our in house powder coat system has allowed us to eliminate this chronic problem. 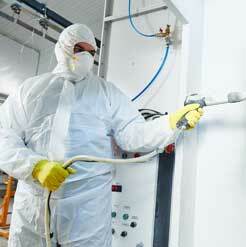 Our in-house powder coating facility was specifically designed with the customer in mind. Not only does our powder coating facility give us complete control over the standards of the springs high-quality finish but it also allows us to reduce outsourcing costs. Through reducing these costs, we are able to provide our customers with better prices without having to sacrifice on the quality of the products. No matter what type of coil spring you are looking for, whether it is hot or cold, and no matter what industry you work for (snowplough, vibratory, automotive suspension, playground, or any industry that needs spring applications), we can help. At RMW Industries, we understand how important it is to you to know that you are getting the best possible coil spring for the job. That is why our team of professional designers and manufacturers will work closely with you in order to ensure that our custom springs live up to your high standards. Our highly skilled team has the experience and expertise that you need to help you complete your next project.